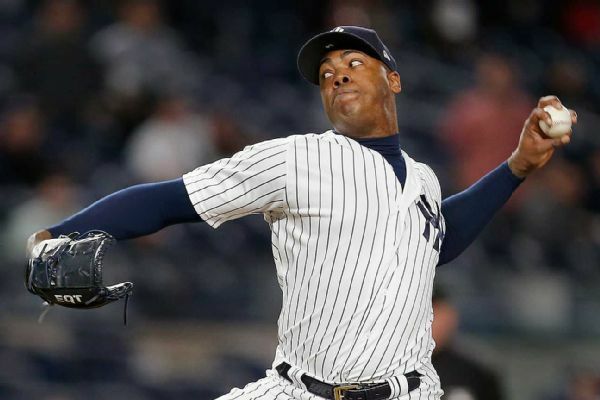 NEW YORK -- As long as strugglingYankeescloser Aroldis Chapman checks out healthy Wednesday night and perhaps into the morning, he's back in his regular slot Thursday, manager Joe Girardi said. The Yankees felt confident enough that Chapman was OK that they did not opt for an MRI, according to Girardi. "He will continue to be my closer," Girardi said before the Yankees' 5-3 win over theMets. "We won't close with him tonight because we're going to let him go through some things. We think that his leg is not going to be an issue, but we want him to go through some things and make sure that it is OK.
Girardi was not overly concerned about Chapman's performance issues, both recent and for the longer term. Since returning from his first disabled list stint of the season (shoulder inflammation) in June, Chapman is 9-for-12 in save opportunities with a 4.09 ERA in that span. He has allowed five runs in 3 1/3 innings in his last three appearances, including a blown save and loss to the Red Sox on Sunday Night Baseball. It's the first time he has allowed at least one run in three straight games since June 2012 with the Reds. With Chapman out Wednesday and Dellin Betances having pitched three days in a row, David Robertsonclosed out the 5-3 win, earning his 14th save of the season after one inning of spotless work in which he struck out two. Robertson entered with a 1.32 ERA in 13 2/3 innings pitched since rejoining the Yankees in late July. The Yankees are well-fortified in the bullpen if Chapman's absence becomes a long-term issue. Betances currently has a 10-inning scoreless streak. Girardi also said he expects CC Sabathia to start Saturday against the Red Sox and that if Masahiro Tanaka's next bullpen session goes well, he will be slotted in to pitch against the Tigers in a series that begins Tuesday. Sabathia, out with knee inflammation, made his last start on Aug. 8. Girardi said he would watch Sabathia's pitch count, but that there would otherwise be no restrictions. Tanaka last pitched the day after that and has been out with a sore shoulder.